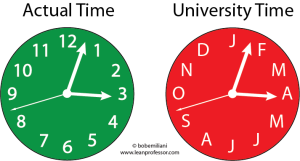 Much of today’s problems in higher education can be attributed to one thing: leaders who have allowed colleges and universities to run on a time scale (months, weeks, days) that differs greatly from the actual time (hours, minutes, and seconds) the world runs on. 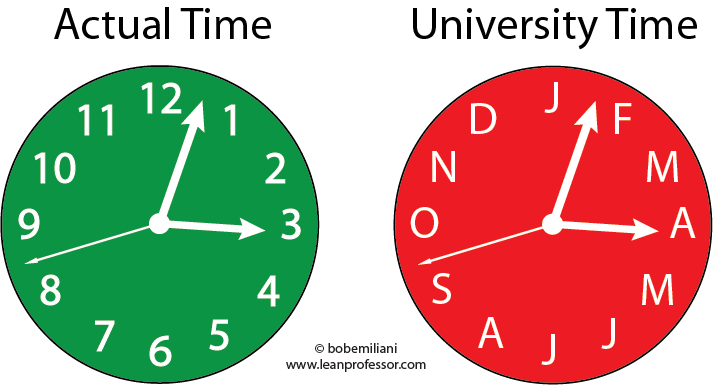 The clock face illustration below succinctly expresses this problem. Historically, the large mismatch between actual time and university time has not been a big problem overall (though it has been specifically for faster moving disciplines, e.g. engineering and business). But, things have changed in recent decades, and the large mismatch means that universities have been slow to respond and make necessary changes. This has given opportunities to those who seek to disrupt the traditional model of higher education. And it has cemented the view among many (students, payers, business leaders, politicians, etc.) that higher education is too slow or unwilling to change. Faculty have long sought to distance themselves and their institution of anything that comes from industry that could disrupt their traditions. While some traditions are important and should be preserved and strengthened, other traditions must be adjusted or eliminated as circumstances change. Knowing a priori which is which is a challenge. It is better to figure this out as part of activities that designed to more closely match what is happening in actual time. Closing the gap between actual time and university time means that universities have to improve leadership processes, academic processes, and administrative processes. Some faculty members will quickly and loudly identify many reasons why this is impractical or why it cannot be done. In reality, it is impractical to defend a tradition that serves nobody’s interest or make false assumptions. In particular, faculty will defend time-consuming deliberative processes as a necessity. Yet process improvement, done right, does not undercut deliberative fact-finding and decision-making processes. All is does is eliminate the queue time between process steps. Decision that once took 52 weeks can be done in 5 or 6 weeks (or maybe 5 or 6 days) – much closer to the actual time the world runs on. Faculty who comprehend any action related to improvement as zero-sum (win-lose) will successfully stall improvement and preserve university by casting doubt in the minds of other faculty and staff. The few will force the many to take an uncomfortable ride. Leaders, therefore, must demonstrate to that outcomes will always be win-win – not only for faculty, but for all other key stakeholders. Think of it this way. A musician who insists on running on actual time (hours, minutes, and seconds) would not succeed in the long run compared to one who runs on musician’s time (second, half-second, quarter second). The exception to your music analogy is John Cage’s Organ²/ASLSP (As SLow aS Possible). A performance of the work is currently underway and scheduled to last 639 years. Duly noted. Click here to enjoy(?) this slow music. But I must say, I think Cage will not succeed in the long run because something will change between now and 2640. Bob, this reminds me of Stafford Beer who wrote extensively about the concept of how organisations deal with variety and that when there’s a change in variety they either need to fully absorb it, or change quickly enough the react to it (which Beer refers to as relaxation time). Basically universities have a model that worked OK 100s of years ago when there was less variety, which could be more easily absorbed, leading to faster relaxation times; whereas today they cannot react fast enough because there is too much variety and their systems are not able to cope with it. Yes, there will have to be some variety reduction, and that must be achieved in ways that do not harm key stakeholders.